How Can I Finish More Projects? When I decided to improve my rate of finishing creative projects, I thought I was bad at finishing. After all, I had only published four articles on our Write to the End blog in three years! But I began looking for “bright spots” – places in my life where I actually did finish things – so that I could try to duplicate any success that I found. I thought that I wouldn’t find much. I was wrong. The first bright spot I discovered was dinner. I produced and served dinner, every day, pretty much at 6 p.m. Here was an example of successful and consistent daily finishing! So I wasn’t bad at finishing after all; I was only bad at finishing creative projects. I continued to analyze the bright spot: Why did I succeed at “getting dinner published” every night at 6 p.m.? Other people counting on me to produce. How could I use this discovery to help myself finish more creative projects? In particular, how could I help myself publish more articles on our blog? I didn’t know, so I went back to looking for bright spots. The next bright spot I discovered was even more valuable because it was related to writing. I’d been sending our Write to the End newsletter (in one form or another) for over 10 years. Here was another example of successful and consistent finishing, and it was actually an example of successful and consistent publishing! The newsletter had the same two helpful characteristics as serving dinner: an external deadline and an audience. 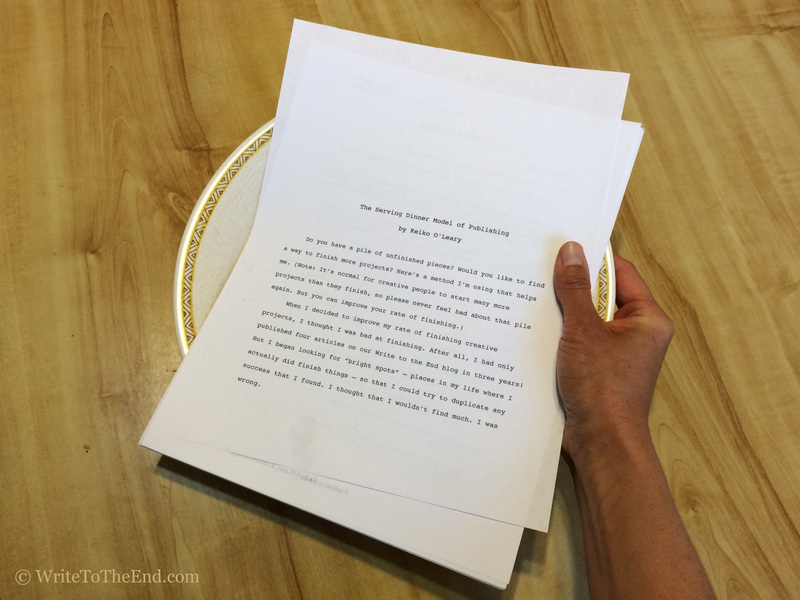 I had discovered the Serving Dinner Model of publishing, and I was already using it successfully! I suddenly knew how I could help myself publish consistently on our blog. It was terrifying to commit to this, but I did it. I added a section for new blog posts to our newsletter, and I promised there would always be at least one new article in that section. The Serving Dinner Model can also be applied to one-time projects. You just have to figure out how to cause other people to rely on you to produce the project by a certain date. Here’s an example of how this has worked for me. As part of Thinking Ink Press, I’ve been making Instant Books (small books folded from a single sheet of paper). My first two ideas for Instant Books are still unfinished, but in the meantime I have produced two others plus a Flashcard (a postcard with a complete short story on it). Why did I not finish the first two projects, but I did finish the other three? It’s because I applied the Serving Dinner Model to the ones I finished. I caused the two helpful conditions to exist by saying to my partners, “I’ll make Jagged Fragments for Anthony to sell at the Clockwork Alchemy convention,” or “I’ll make Bees for Betsy to sell at Play on Words.” Boom! Instant deadline and audience. My first two Instant Book ideas have never had an upcoming author event associated with them, so I have had trouble setting aside other things to work on them. But I want to finish them, so I will be looking for opportunities to apply the Serving Dinner Model. What about you? Would you like to try the Serving Dinner Model? What’s one thing you’ve been wanting to produce? For that particular project, how can you get an external deadline and people counting on you? If you like, go ahead and leave a comment to let us know your plan. This entry was posted in Process, Productivity, Tips and tagged advice, bright spots, deadlines, finishing, projects by Keiko O'Leary. Bookmark the permalink.